To celebrate national Small Business Week, WalletHub polled small business owners across the country on the state of their finances. We asked about everything from the key ingredients to small business success and where to get the best business credit cards and bank accounts to how companies will use savings from President Trump’s tax reforms. You can find the complete results below along with additional insight from a panel of experts. 24% of business owners say National Small Business Week helps their business. Business owners age 18-29 are 8 times more likely than business owners age 59+ to say that National Small Business Week helps them. More than 7 in 10 small business owners say now is a good time for businesses to grow. 23% of business owners say businesses will primary use savings from President Trump’s tax changes for executive and investor bonuses. 12% believe it will go to employee compensation. While 84% think the user protections on business credit cards should be at least as good as those on personal cards, business cards currently lack a number of key safeguards. Easter is much more than an occasion to break out your Sunday best or hop into a bunny costume. It is a day of great religious significance for the roughly 70% of Americans who classify themselves as Christians, marking the resurrection of Jesus. And it actually takes place twice most years because of differences in the Western and Orthodox calendars. Easter also is a big donation day for U.S. churches, thanks to the year’s highest attendance rates. It’s a significant revenue-driver for companies in the candy business. And it’s a source of divisiveness for those who feel strongly about the best way to eat a chocolate bunny or the proper filling for a chocolate egg. No one likes Tax Day, except for accountants and Uncle Sam. In fact, disdain for filling out forms and forking over funds to the government drives many of us to contemplate some pretty kooky alternatives. For example, according to WalletHub’s Tax Survey, nearly one in four Americans would get an “IRS” tattoo in return for a tax-free future, while 36% say they would move abroad for a tax-free future. It’s no wonder, either. We’ve spent billions of hours preparing billions of dollars in payments since tax season began Jan. 28. We’re grappling with a tax code that’s longer than all of the Harry Potter and Game of Thrones books combined. We’re also scrambling to satisfy and take full advantage of recent tax reforms. Tax preparation can be a frightening prospect for many people as a result. It’s a tradition unlike any other and the unofficial start of spring for golf fans nationwide. But the beauty of April flowers at Augusta National Golf Club, once a plant nursery, belies the danger lurking for the 84 participants in the 83rd Masters Tournament, especially with Tiger back on the prowl. Plenty of prayers will be made around Amen Corner, to be sure. And we may even see some showers from the eyes of players who either overcome or succumb to the pressure. To help get you in the mood for golf’s first major of the year, WalletHub analyzed the tournament from tee to green, collecting interesting Masters facts along the way. You can check out our findings in the infographic below, followed by a Q&A with a panel of golf experts. Enjoy the action! Coming down with March Madness before the Big Dance may sound like an excuse to skip prom, but it actually describes our nationwide obsession with the NCAA Men’s Basketball Tournament. This 68-team basketball bonanza has been known to crown a Cinderella or two, produce at least one shining moment a year, and turn millions of Americans into illegal gamblers. It’s that good. It’s also a big business both on and off the court, making millionaires out of coaches, conference commissioners and NCAA executives but very few players. Tournament time takes a toll on fans’ wallets, too, and not just in terms of the millions we lose in bracket pools each year. The average single-game ticket costs about $258, for one thing. Around 20 percent more beer is sold to keep up with cheering fans. And there’s the potential for some workplace conflict, since distracted employees cost businesses about $4 billion per year. Whether you see it as a civic duty, a necessary evil or cause for a few choice expletives, it’s no surprise that most of us dislike tax time. From the expense and hassle of the process to questions of fairness and fears of basic math, there are many reasons for our April angst. But just how much do we dislike taxes and tax collectors? Will President Trump's reforms make things better or worse? And what would we do to get out of paying? 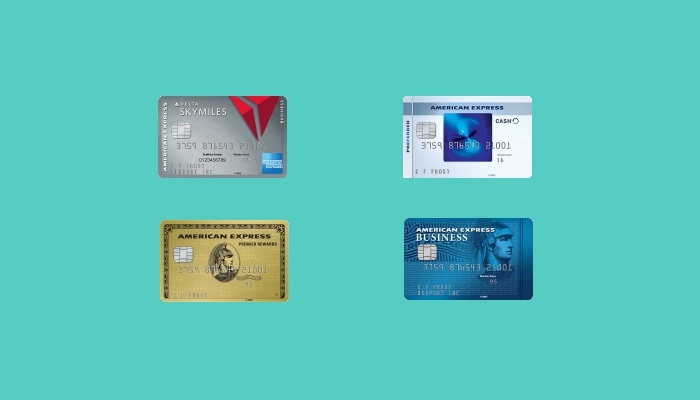 Credit cards offer plenty of perks, from rewards on every purchase to 0% APRs. But credit cards can also get us into trouble if we aren’t careful. 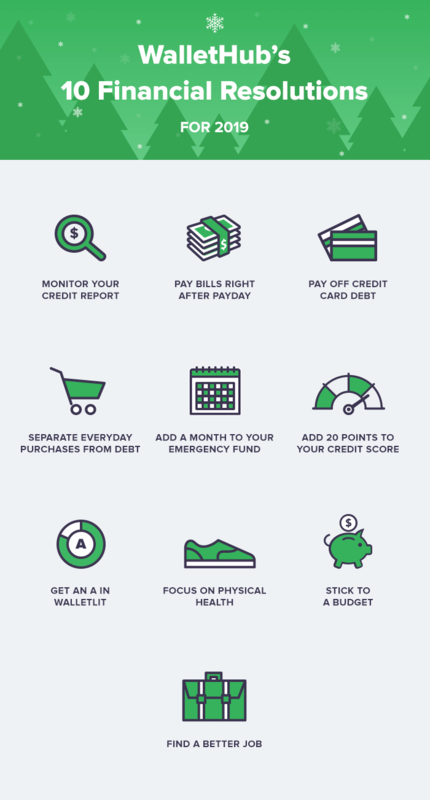 Reducing debt and adopting sustainable spending habits are particularly important, so WalletHub decided to see how consumers are approaching those tasks. We performed a nationally representative survey online. You can find the complete results in the infographic below, along with some key takeaways from WalletHub’s latest Credit Card Debt Study. International travel is costly enough without having to pay extra just for swiping, dipping or tapping your credit card beyond U.S. borders. But foreign transaction fees are lurking, even domestically. Any purchase made through an international merchant and processed abroad is subject to a foreign fee. To get a better understanding of what consumers know about foreign fees, how they influence our card choices and more, WalletHub conducted a nationally representative online survey from April 16 to April 24. We asked people about everything from their international travel and spending habits to whether they worry more about Chinese tariffs on steel or foreign transaction fees on credit cards. You can find the complete results in the following infographic. Don’t forget to don green and drop your keys if you want to avoid getting pinched come March 17. Despite its religious undertones, St. Patrick’s Day often results in some light bruising for folks whose dress doesn’t express the Emerald Isle’s characteristic hue. It also ranks among the year’s most popular drinking occasions. Each year, nearly 33 million Irish-Americans and fellow partiers worldwide raise pints of Guinness and forkfuls of cabbage in the name of Ireland’s primary patron saint. But the good times are too often ruined by drunk driving, which can have a devastating impact on lives in general and wallets in particular. So in addition to checking out the interesting St. Patrick’s Day facts presented below, be sure to keep your celebrations safe this year. The cost of an Uber or Lyft ride pales in comparison to that of a DUI, after all. For many people, Mardi Gras is all about the three B’s: beads, booze and the Big Easy. But this multi-week carnival, which runs from Epiphany through Fat Tuesday every year, isn’t confined to New Orleans or the tawdry pursuits of partygoers. Mardi Gras actually has a Christian foundation, dating back to 17th century Europe, as a time for festivities before the fasting and sacrifice of Lent. It was first celebrated in the United States in what is now Mobile, Ala. And it has become an economic force, generating more than $1 billion for the New Orleans and Mobile areas each year. Americans are known for being big spenders…sometimes, too big. With an average household credit card balance of more than $8,200, many people now cannot keep up with the payments on their debt. In a nationally representative survey conducted by WalletHub, nearly 16 percent of respondents said they believe they will miss at least one credit card due date in 2019. That works out to about 40 million Americans. Missing a credit card payment can start a chain reaction of negative events. First off, there are late fees of up to $28 for a first offence and $39 for another within six months. In addition, cardholders not already carrying a balance between months will lose their grace period, and interest will start accruing immediately on both new purchases and the unpaid balance. There might also be a high penalty APR on new purchases, depending on the issuer, and this rate can be applied to all balances after the cardholder is 60-days past-due on payment. Lastly, if the credit card issuer reports a late payment to the credit bureaus after it’s 30 days late, it will cause damage to the cardholder’s credit score. This can lead to higher costs and fewer borrowing opportunities in the future. Oscar turns 91 in 2019. And like many seniors who came of age in a different era, this golden guy has had a tough time adapting. Hollywood’s biggest bugaboos – racial and gender equality – are far from resolved. But the movie industry’s stars say time’s up, and much of the fanbase echoes that sentiment with a chorus of me-toos – partly why the ceremony has no host for the first time in 30 years. The nominations for the 91st Academy Awards also include a record number of women. Whom Oscar goes home with remains to be seen, of course. The same also goes for whether PricewaterhouseCoopers’ 85th time tallying the votes will produce another Moonlight-esque switcheroo. But you don’t have to wait to get in the Oscars spirit. There are lots of great movies to catch up on, plus plenty of interesting Oscars stats to dig into. Whether you love it or loath it, there’s no denying that Valentine’s Day is a big deal. We spend billions of dollars on the occasion each year. And there’s a lot riding on what we do (or don’t do) in Cupid’s name on February 14, to the extent that it could affect whether some people wind up filing joint or individual tax returns come April. To learn more about exactly how consumers are approaching Valentine’s Day 2019, WalletHub conducted a nationally representative online survey. We asked about everything from what people plan to buy and how much they plan to spend to financial turnoffs and how money problems affect relationships. You can check out the complete results in the infographic below. Lovesick shoppers shell out more than $20.7 billion in Cupid’s name each year. That makes Valentine’s Day the third-largest consumer holiday in the U.S. But love might not be the only motivator. Roughly 44% of people expect their Valentine to spend at least $50 on a gift, according to WalletHub’s 2019 Valentine’s Day Survey. More than 4 in 10 people also would break up with their significant other if he or she spent irresponsibly. So fear is a factor, too. Whether you love or loath his holiday, there’s no denying St. Valentine’s impact on our wallets. So WalletHub examined V-Day from all angles in the hopes of helping people embrace their loving feelings without hurting their finances. Atlanta is where the players play, and this year they’ll be doing it for the title of Super Bowl LIII (53) champion. The 2019 version of the NFL’s big game will feature plenty of familiar faces and traditions. Tom Brady, Bill Belichick and the New England Patriots are making their third straight run at the Lombardi Trophy in their eighth Super Bowl appearance since 2003. Millions of people will tune in on television, as usual. And we’ll again consume more than a billion chicken wings while watching billions of dollars’ worth of commercials with a bit of football mixed in. Lurking behind the standard hoopla, however, are a relatively unfamiliar setting, some young, newly relocated upstarts and an unanswered question. Atlanta is hosting the Super Bowl for just the third time, in the 4th big game held in a retractable roof stadium. The Los Angeles Rams are set to make the franchise’s fourth Super Bowl appearance overall and their first since moving back to Los Angeles from St. Louis in 2016. And everyone wants to know whether the Rams’ youthful quarterback-head coach combo, with an average age of just 28.5 years old, can dethrone the NFL’s elder statesmen from New England (average age of 53.5). The holiday shopping season is over now, and many Americans are seeing the impact on their credit card bills and bank statements. During the holidays, people often make a lot of large purchases, and sometimes max out their cards in order to do so. In a nationally representative survey conducted by WalletHub, 34 percent of respondents say they worry about maxing out their card with a large purchase. That’s certainly a legitimate concern, considering Americans’ tendency to rack up credit card debt. After all, we hit over $1 trillion in total credit card debt for the first time ever in 2018. And while people with high incomes and stable employment may have no trouble putting large purchases on a credit card, reaping rewards, and paying them off quickly, it’s a different story for Americans with less stable incomes. When it comes to non-essential large purchases, they may be better off saving up and paying in cash. “If they don’t pay bills monthly and carry a balance with a high interest rate, relying on cash is a good discipline,” says David Laibson, a professor of economics at Harvard University. Note: Information listed on this page is outdated. Our editors are currently working on updating the information. Just because the holidays have come and gone does not mean the holiday shopping season is over. Its final act is actually just beginning. Many people have unwanted gifts they’d like to return, which can lead to more shopping plus a fair amount of frustration. We also have holiday debt to deal with and financial resolutions we’re trying to stick to. We all have our fair share of vices and room for improvement, especially when it comes to money. So it’s unsurprising that financially-themed resolutions are among the most popular made each new year. But the fact that less than 10% of resolution-makers achieve their goals is not a good sign for hopes of improved money management. Foresight leads to preparedness, and being prepared really pays off when it comes to personal finance. 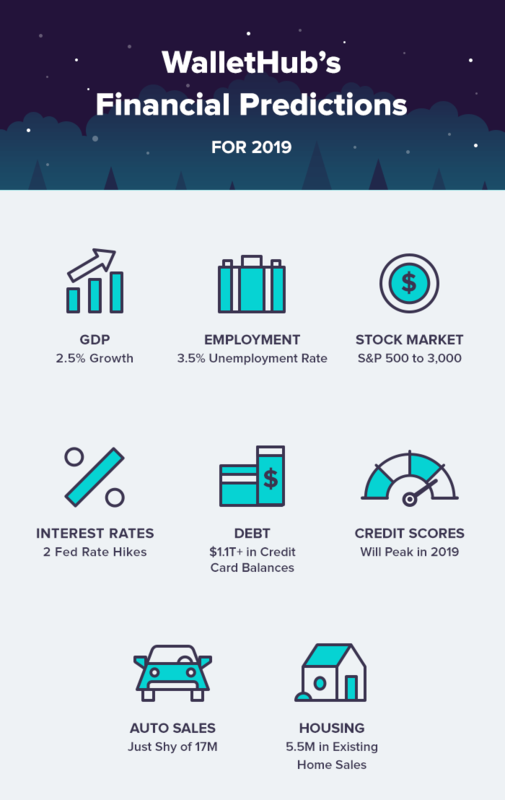 So to help you get ready for the months to come, WalletHub’s editors surveyed a panel of economics experts, analyzed big-bank projections and Federal Reserve forecasts, and produced a list of financial predictions for 2019. Below, you can check out WalletHub’s projections for everything from GDP growth and stock market gains to credit card debt and credit scores. And that’s followed by additional commentary from our expert panel. Disclaimer: Editorial and user-generated content is not provided or commissioned by financial institutions. Opinions expressed here are the author’s alone and have not been approved or otherwise endorsed by any financial institution, including those that are WalletHub advertising partners. Our content is intended for informational purposes only, and we encourage everyone to respect our content guidelines. Please keep in mind that it is not a financial institution’s responsibility to ensure all posts and questions are answered.